Hotel restaurants face special challenges. Their kitchens must accomodate the rush of conferences, wedding buffets, and more. They often provide room service, breakfast, lunch and dinner. They handle numerous special dietary needs. They must answer to corporate accountants who monitor for profitability. These extra duties can distract from the culinary goals of a chef, making it difficult to excel in the kitchen. By attempting to make everyone happy, many such large corporate restaurants merely achieve mediocrity. Thankfully, Parcel 104 is an exception to this pattern. Founded by restaurant impressario Bradley Ogden, Parcel 104 furthers Ogden's goals to define high-end American cuisine with a focus on farmstead meats and produce, seasonal sensitivity, and creative cooking rooted in Western tradition. I admit that I tend to shy away from big restaurants. As a reviewer I usually champion smaller family businesses. I probably wouldn't have tried Parcel 104 had they not invited me to an introductory dinner, which they paid for. I accepted their invitation with some trepidation, prefering to review restaurants anonymously. I prepared myself to be hypercritical. I needn't have worried. Parcel 104 excels with flavorful food, attractive environment, attentive service, and clarity of concept. Concerned that we might have received special treatment, I noticed that other customers received the same attentive service that we did. Their entrées came plated just as beautifully. Parcel 104's corporate backing has actually empowered a fine chef to realize his dream, offering a well-conceived selection of dishes with the freshest ingredients in a stylish and classy environment. Good concepts carry little weight without good implemetation, and Parcel 104 has excellent leadership in the hands of executive chef Bart Hosmer. 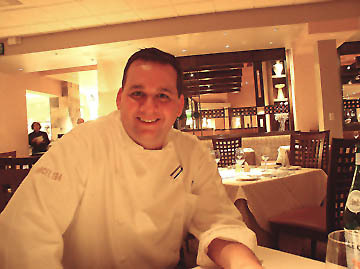 This Bay Area native previously led kitchens at the Whitehall Hotel in Chicago, the Flying Fish Cafe at Disneyworld, Ogden's Lark Creek Inn and others. He returned to the Bay Area in 2001 to rejoin Ogden for Parcel 104. Hosmer explained that name Parcel 104 comes from the pear orchard that once occupied the region now covered by the Marriott, Mission College and Great America. The restaurant pays homage to its farmland predecessor by sponsoring weekly farmers' markets in summertime. Chef Hosmer hopes the farmers' market will reach out to locals, most of whom would not consider driving to the Marriott Hotel for a special dinner. When I spoke with him, Hosmer listed with enthusiasm the different growers for free-range meats and local organic produce that supply his kitchen. He adjusts his menu daily as ingredients become available. I could taste this passion on every plate. The kitchen successfully expresses the ideals behind the food, with clean flavors and sauces that flatter fresh ingredients rather than overtake them. To get a sense of Hosmer's broad and changing menu, we split plates from several different dinner courses. We could have ordered the chef's tasting menu, a five course sampler for $58, but we wanted to see how the standard dishes appeared. A tiny amuse bouche arrived first, a demitasse of Sweet Dumpling Squash Bisque. This subtle creamy soup showed a delicate infusion of nutmeg, allspice, cinnamon and clove, with a wafting of fennel from the vegetable mirepoix. These accents never overpowered the sweet taste of the squash, but deepened it with a whisper. Having tasted the bisque, we skipped a soup course ($7). Instead we tried Yellowfin Tuna Tartare ($12), a cylinder of raw tuna topped with a tapenade of calamata olives, carrots, sweet red peppers, scallions and lemon oil. The olives had been rinsed and sautéed to soften their flavor. 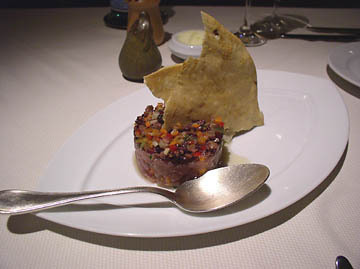 Two bread crisps stood like a flag from the tuna, offering an edible utensil to accompany the fresh pink yellowfin. Other appetizers sounded similarly delicious: an iced shellfish platter with three types of oysters and a crab claw ($16); Maine lobster hot pot with truffled herb broth ($12); even frog legs with honey sauce and apple slaw ($12). We tried three different entrees from that night's menu. All of them showed creativity balanced with classicism, generous portions with artistic presentation that never seemed overworked. Dayboat Scallops with Veal Marmelade ($25) offered a marriage of sea and land that allowed wide oportunities for wine pairings (especially pinot noir.) Four large fresh scallops sat atop a mound of shredded veal reduced with red wine and orange zest. Topped with sweet palm hearts poached in butter, the quickly seared scallops retained their tender texture with an almost-raw interior. The veal came from Marcho Farms in Pennsylvania, a Mennonite farm which lets its calves walk freely, fed on whey from farmstead cheese. The light earthy flavors from the skirt and flank steak added depth to the scallops, bridged by the tart sweetness of citrus. An even more surprising pairing of sea and land came in the form of seared yellowfin tuna topped with Sonoma foie gras ($26, see photo at top), accompanied by a demitasse of celery foam. This creation arrived on a bed of sautéed crones, tiny root vegetables that look a bit like shrimp and taste subtly sweet and nutty. 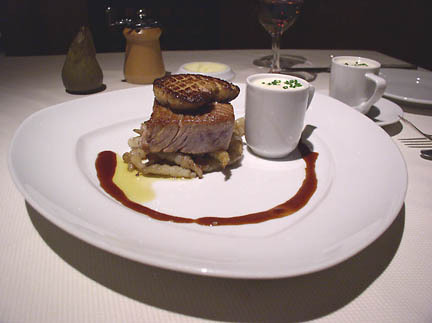 The kitchen had quickly seared both tuna and foie, leaving the tuna delectably raw but for a thin layer top and bottom. A drizzle of veal stock reduced with pinot noir added richly flavored artwork to the sizable plate. The celery foam reminded me of David Kinch's innovations at Manresa (Los Gatos), combining sweet and salty flavors with surprising textures. It added a light but creamy contrast to this intense dish. We concluded our savory courses with Jameson Farm lamb T-bones topped with black trumpet mushrooms ($36). The lamb sat atop a bed of puréed cannellini beans, infused with rosemary and black truffles. The earthiness of the mushrooms and aromatic herbs merged with a reduction sauce made from the braising liquid. While the two chunks of lamb looked large, the center bones took up most of the volume. Some diners may wish for a slightly meatier cut, but the wild mushrooms compensated well, with truffle perfume infusing every bite. Pastry chef Carlos Sanchez has a knack for turning simple-sounding desserts into artwork. He modifies the sweets menu daily. All desserts cost $6. The Chocolate Lover's Dream offered four decadent little explosions of high quality chocolate, including melted Valhrona brownies, Scharffenberger chocolate custard, an espresso cup full of Mexican hot cocoa, and a tiny ice cream sandwich made from fluffy meringues. Each of these chocolate tidbits showed soft finesse and lightness, rather than the full frontal attack of dark chocolate that one might infer from the description. I appreciated the light touch after our lingering feast. Luckily our waiter pointed out that the Chocolate Persimmon Napolean didn't involve chocolate at all, but used the dark fleshed fruit called chocolate persimmon. The Napolean arrived as an oozing stack of vanilla custard, thin phyllo crackers with a crust of brulée sugar, layered with slices of sautéed persimmons, in a pool of light rich caramel sauce. Its flavors matched the Autumn season perfectly. Carlos' Caramel Flan showed classic smoothness and a velvety soft mouth-feel. The small disk of egg custard came framed in an ultra-wide lipped bowl with just a dollop of whipped cream and a mint sprig. A formidable 25 page wine list offers unique and intelligent selections. General manager Robert Sharpe updates the list daily as rare stock rotates, and our waiter showed good familiarity with the wines. Prices range from about $30 to hundreds per bottle. Markups range around 200% to 250% of retail, with lower margins on premium bottles. The list featured some exceptional high-end wines priced very fairly, like Fisher's 1997 Wedding Vineyard Cabernet ($127/bottle), a chameleon that changes constantly in the glass as it breathes. At auction this wine sells for over $100. Wines by the glass range from $7 to $20, with a well-chosen selection covering a dozen varietals. I tasted several of these, and found the suggested pairings worked beautifully. Babich Riesling from New Zealand ($8) showed floral honey perfume with a light clean palate, adding finesse to our early tastes of soup and raw fish. The J. Lohr Syrah ($9) had a deep blueberry nose with intense tarry fruit, accenting rosemary flavors in the lamb. The Iron Horse Pinot Noir ($15) paired with everything we tasted. 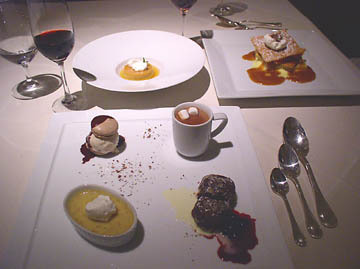 Diners can arrange tasting sequences to accompany different courses, with 2 oz. pours of different wines offering a range of optimal pairings. Some restaurants cost a lot but disappoint with heartless glitz. Parcel 104 is expensive, but its food delivers on the promise of freshness, balance and discovery. It feels worthy of the expense. In the jaded haut-cuisine culture where novelty wears thin, a chef can feel challenged to find an original creative voice without losing balance or tradition. Somehow Bart Hosmer has found a balance between European classicism and California clarity that feels totally natural yet fresh and creative. For special occasions Parcel 104 merits a journey to the Marriott, foreign though its location may seem.